Makkai Matar Tamatar or Makai Matar Tamatar is a delicious gravy dish that you can make for rotis. When I think about how I ended up making this gravy, surely makes me want to recollect again. There are times when you wonder how time flies. I know this is one cliched statement I get to repeat so often. Can you complain if the days literally fly? Just another couple of weeks and the year just passes you by! I wonder if I have done what I have set out to do. I don’t think much these days, there is hardly much time on hand. What with work, kids and blog themes, I have more than what I can bite. Though I don’t complain. However when I think of the goals I had thought off, at least those that I had in mind, the ones I could proudly say I accomplished, would be cooking more from my files. For that again I must thank my own nocturnal musing that came about with this idea of Cooking with Cookbook event. I actually walk about with my clippings on hand. If one would so ask me what I was up to, I might hesitate to share, least they think I was off my mind. I have sorted my files and have taken out my clippings. I decided that I must check out those papers and trash those I will never be able to cook and cook what I can. So from one of the papers finalized, came this gravy. A delicious one with baby corns and that clipping has more to come. Anyway this is the only one going to be featured here. I made it for one of the week day dinners. As always I assumed I will have all the ingredients. Sadly the recipe asked for kashmiri chili powder, whereas I had whole chilies. So I had roast and pound them. It is like those chili flakes accompanying pizzas, only the spice gets at you after you finish eating. On the whole except Dad, everybody liked it. Even kids ate this, so I am glad to share another one that can easily be a kids gravy as well. This is part of the Cooking from Cookbook November Week 2 edition. Wash and remove the silk thread from the baby corns. Cut into small pieces, wash and MW for 5 - 7 mins. Drain and keep it aside. In a non stick pan, heat the butter, add finely chopped onions, green chilies, saute well till the onions turn colour. Then add the spice powders, salt. Saute on high. Now add the fresh peas, continue sauteeing. Now add the cooked corns, stir well. Cook on high till all the moisture dries and the peas and corn gets roasted well. Now add the tomato puree and mix well. Next simmer and add the milk and 1/2 cup water or as required. Bring to boil. I had whole Kashmiri red chilis, so roasted and ground them. However since it was still very less amount, it was a coarse powder. Since the spice is only green chilies and Kashmiri red chilis, adjust the spice accordingly. The baby corns tend to be tough, so you can cook more if you prefer very soft ones. The gravy was a bit spicy after eating, so you can either increase the cream or reduce the spice. Though it wasn't so spicy for the rest at home. That is one delicious gravy! My kids love baby corn and they will like this recipe for sure. Looks very yummy, Valli! I might have to pick another ingredient instead of the baby corns, will surely try this. 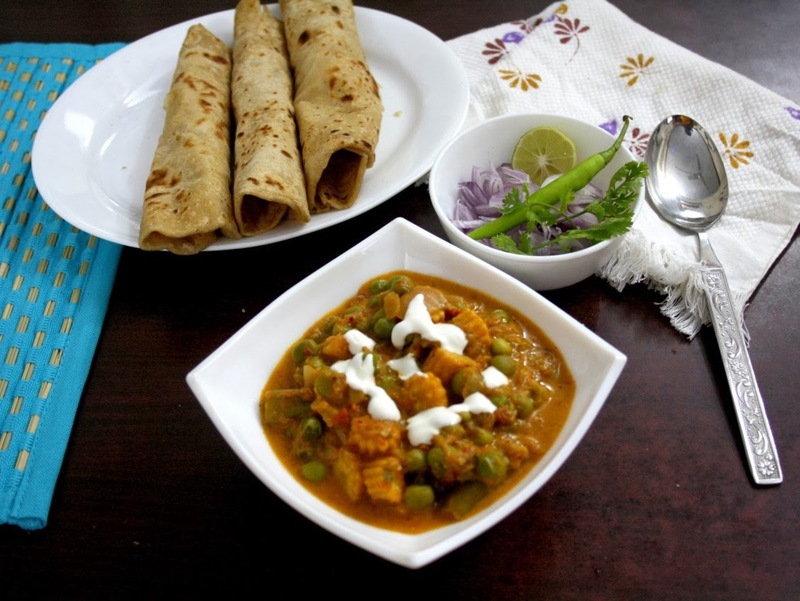 Wat a fantastic side dish for rotis, i can have this dish everyday..
Baby corn and peas are two of our fav veggies. Looks very tempting Srivalli. looks very tempting and delicious…. That is a nice gravy to serve with both roti & rice. That must have tasted so good I am sure everyone enjoyed it. I love the recipe valli so good.